The Quick Copy is a powerful tool for copying data from one SAP Business One company to another however, it requires planning and understanding in order to best utilize it. This post refers to the major settings that impact the copy process. For example, Chart of Accounts is supported only by ‘Delete All Records Then Add New Records’ copy method, while copying Tax Group is supported by all methods except ‘Delete All Records…’. The online help contains a detailed description of the supported copy methods for each data category. Counting on that working assumption,first, you need to select the required copy method and according to this, the respective data categories will be made available in the data categories tree. You can either use the accounts from the source company or use the default accounts in the target company. For example, in the source company, G/L account code 1000 is defined for warehouse 01 and G/L but account code 1000 does not exist in the target company. When you copy the warehouses from source company to target company, if you select ‘Use Accounts in Source’, then the import will fail, since G/L account code 1000 does not exist in the target company, but if you choose ‘Use Default Accounts in Target’, then the default G/L account defined in the target company will be defined for warehouse 01. Last but not least – when copying data, almost all the objects depend on the company’s localization and thus the localization of the source company and target company must be identical. 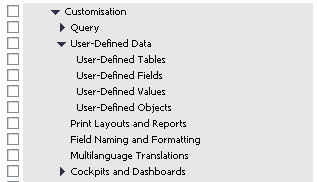 There are few exceptions, such as the ‘Customization’ category (UDFs, Queries, etc.) that can be copied across different localizations and also ‘Users’ object along with its authorization and form settings.